I've been dabbleing in the SMPS arena, and might need some low power high voltage bootstrap supplies for a project. I'm thinking of baseing them on Roman Black's very minimalistic converter: http://www.romanblack.com/smps/smps.htm Which is based on Richard Ottosen's SMPS. Now my friend Gary says I should just get an dev kit like the SLUU068C for $100 and add beefy power blocks to it. 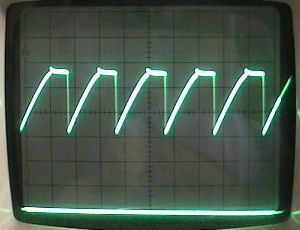 Clif, your circuit seems to alternate long and short cycles somehow, the trace does not look like Roman's.Yes Robert, it's called PWM and for the load it has on it which is somewhat different than Roman's example, this is the pattern it uses to regulate the voltage. It's caused by the fixed off time and that it falls a little bit behind on the short cycle but makes up for it on the long one. If I turned up the current draw I think they would even out.